This is not my usual type of read, but I am very curious about it. I had it in my hands at the library one day but put it back down. I think I better put it on the wish list. Everyone seems to like this one! 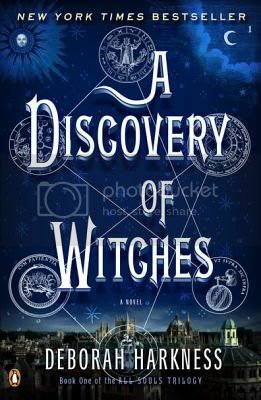 I got this last Friday, started reading and am now totally screwed because I have other things I must read, but I can’t stop A Discovery of Witches and it’s kind of long. Addictive is a great word to describe it, I just need to find out what happens next! Your review, as well as the responses, make me want to pick the book up. Nothing I like better than a read that totally captivates me. My sister loved this book too! I also enjoyed this one! It felt well thought out, and like there is a lot there still to be discovered. Yes, Matthew is a bit of a jerk, and I hope that this continues to be addressed as the books continue. I’m really excited for the next one! I read this back in November and was really surprised at how much I really, really enjoyed it. I agree that the beginning of their relationship was a bit…off, but I think as the story progressed it went down the better path and I really enjoyed the two of them together. I’m eager to see what the next one brings. Dammit, I still need to read this one. That sounds really interesting! After I saw the giveaway, I wanted to check out the review — now I really hope I win!